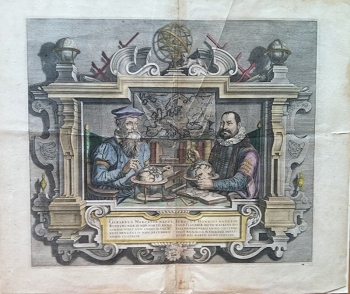 This beautiful image is of a well-known portrait of the two mapmakers surrounded by the globes, spheres, maps, books and instruments of their art and profession. It may suggest Hondius being the successor to Mercator since he acquired Mercator's stock at auction in 1604. The print is 22 x 19 inches and has lovely modern hand coloring. It may be as early as 1613.